While many students aim high with hopes of getting into their dream school, the fact remains that for the best – and most popular – colleges and universities there is simply not enough room to keep up with the demands of applicants. As an example and to give some perspective, Harvard University’s most recent admission data shows that only 6% of applicants were admitted. 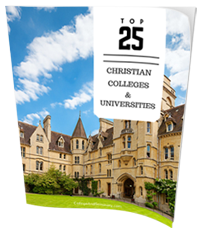 Drawing from the list of schools associated with The Council for Christian Colleges & Universities (CCCU), this ranking highlights ten of the most difficult Christian colleges and universities in the country to gain entrance based upon the school’s admissions rate (percent admitted) for Fall of 2014. Located in Point Lookout, Missouri, College of the Ozarks is unique in that students are charged $0 tuition – an incredible feat made possible through the combinations of combining state grants, scholarships, and the school’s on-campus work program. Due to this remarkable tuition cost (or lack thereof), the school’s admission rate is necessarily one of the lowest in the nation at just 8%. The largest Christian university in the world, Liberty University is located on a 7,000 acre campus in Lynchburg, Virginia and offers 300 residential degree programs and 243 online degree programs ranging from undergraduate to the doctoral level. Over 110,000 students are currently enrolled, yet admittance percentages into Liberty are low, with only 22% of applicants accepted. Located in Lake Wales, Florida, Warner University offers affordable, quality Christian higher education. Named one of “America’s Best Colleges” by S. News & World Report, Warner offers degrees at both undergraduate and graduate levels through their three distinct schools: School of Ministry, Arts & Sciences; School of Business; and School of Education. Total percent of applicants admitted to Warner: 26%. Originally known as St. Paul Bible Institute before changing its name in 1992, Crown College offers over 40 accredited undergraduate majors and also provides a variety of online and graduate degree options. Located in Saint Bonifacius, Minnesota, Crown is affiliated with the Christian and Missionary Alliance, has received a number of recognitions nationally. The school has an acceptance rate of just 28%. Hope International University (HIU) is a private Christian university located in the heart of Orange County in Fullerton, California. With an attractively low student/faculty ratio of 14:1, HIU offers a variety of undergraduate and graduate degrees which may be earned on-campus or online. Less than half of applicants are accepted at HIU as the school’s acceptance rate is a low 31%. A school which began with the prayers of a few local women, Columbia International University (CIU) was first established in 1923 and is located in Columbia, South Carolina. A nationally ranked and recognized school, CIU offers 19 undergraduate majors and has currently enrolled over 1,000 students. CIU’s acceptance rate: 33%. Located in Houston, Texas, Houston Baptist University (HBU) offers a tight-knit college community due largely in part to the school’s commitment to small class sizes. 40+ majors and minors, 8 pre-professional programs, and 16 graduate-level degree and certification programs are offered through HBU’s eight schools and the school’s acceptance rate is just 36%. 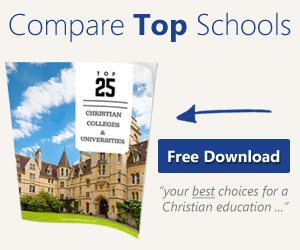 Corban University is a private Christian institution located in Salem, Oregon. Corban offers 10 undergraduate majors and 15 study-abroad programs. Ranked by the S. News & World Report as #5 in the Best Colleges in the West category, Corban also holds the distinction of being one of the first universities to make online learning available to its students. The school’s acceptance rate is 37%. Toccoa Falls College (TFC), of Toccoa Falls, Georgia, is located on a large 1,100 acre campus. Affiliated with the Christian and Missionary Alliance, TFC combines academic excellence with a biblical worldview and offers 29 undergraduate in a variety of areas. Over 900 students are currently enrolled; the school’s acceptance rate is 37%. Located in York, Nebraska on an urban, 50-acre campus, York College is a private, Christian liberal arts institution affiliated with the Churches of Christ denomination. York offers a number of undergraduate degrees available both on-campus and online as well as a variety of pre-professional and graduate level programs. The school boasts a 56% retention rate and a 37% graduation rate. The school’s acceptance rate is currently 41%.